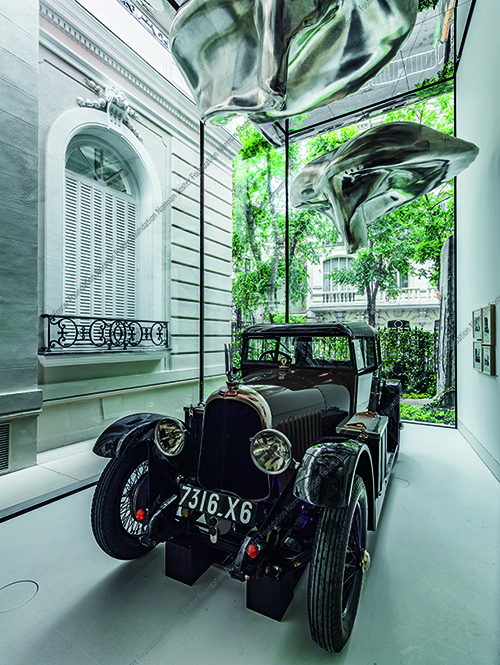 As part of the Norman Foster Foundation Collection lives the Voisin C7, that was pre-owned by Le Corbusier. The iconic Voisin C7 was built in 1926 and shaped many of Le Corbusier’s ideas, ideas that he applied in his architecture and urban planning. For Le Corbusier, the automobile was the ultimate translation of modernity and technique combined together in a single object, and was a firm believer that architecture had many lessons to learn from such a machine. Gabriel-Eugene Voisin, born on 5 February 1880, built his fame on airplane manufacturing during World War I. Once the war was over, as plane demands dropped Voisin decided to redirect the business towards automobiles. He founded Avion-Voisin in 1919 and for the following 20 years, he created some of the most revolutionary and original cars in the 1920s and 1930s. Heavily influenced by Voisin’s aviation background, the Avion Voisin were luxurious and potent machines with an art-deco inspiration. They applied aviation construction methods and materials like aluminium while using strategies to increase its aerodynamic performance. Swiss architect Le Corbusier had a strong connection with Gabriel Voisin. Le Corbusier was a declared devotee of the car, and repeatedly praised motor vehicles in his writings and projects. For him, the car was the genuine “transport machine”, one that, with its rapidity would need a separate layer from pedestrians, a new layer that would drastically affect urban planning and would reshape the cities to come. It was a single object that embodied power, speed, transportation, and functionality; for Le Corbusier, a technological symbol. During the 1920s, automotive technology was progressing at a frenetic rate, bringing with it a new dimension of the perception of time and distance. With an urge to include these conditions Le Corbusier designed urbanistic utopias, megalopolis where the automobile represented a symbol of modernity and progress and was the clear focus of these new cities. He approached the heads of the French leading automobile companies, Peugeot, Citroën, and Voisin to seek a solution to the arousal of the car in Paris. The most receptive of these was Gabriel Voisin, who supported Le Corbusier’s plan, consequently, it was named after him. Therefore, Corbusier’s Plan Voisin aimed to create a contemporary city, able to support the deluge of cars avoiding a congested and dirty city centre. Owner of a Voisin C7 Lumineuse, Le Corbusier was also highly influenced by it in his designs. Houses for Le Corbusier were “machines for living”, both in functionality and in production. From the concept of mass production, developing a series of experiments on pre-fabricated houses like the Dom-Ino House or the Maison Citröhan. Quoting Le Corbusier on Towards a New Architecture ‘If houses were constructed by industrial mass production, like chassis, unexpected but sane and defensible forms would soon appear, and a new aesthetic would be formulated with astonishing precision’. On the functional layout of the building, for instance, iconic Ville Savoye floorplan was designed with the turning radius of the car. The intention was to allow the vehicle to comfortably approach the house, highlighting its importance within the daily dynamics. Lately and following his passion for automobiles, in 1936 together with his cousin and business manager, Pierre Jeanneret, designed a car. It was the result of a competition sponsored by France’s Société des Ingénieurs de l’Automobile (SIA) that sought to create an inexpensive simple car for the people. It was meant to be a minimum vehicle with a maximum functionality, therefore it was named Voiture Minimum. It was 370cm long and 185cm in width and height and it could comfortably accommodate 3 people in the front and an extra seat, that could be transformed into a camp bed, on the back. Even if it was never built, it did serve as an inspiration for later vehicleGabriel-Eugene Voisin, born on 5 February 1880, built his fame on airplane manufacturing during World War I. Once the war was over, as plane demands dropped Voisin decided to redirect the business towards automobiles. He founded Avion-Voisin in 1919 and for the following 20 years, he created some of the most revolutionary and original cars in the 1920s and 1930s. Heavily influenced by Voisin’s aviation background, the Avion Voisin were luxurious and potent machines with an art-deco inspiration. They applied aviation construction methods and materials like aluminium while using strategies to increase its aerodynamic performance. Swiss architect Le Corbusier had a strong connection with Gabriel Voisin. Le Corbusier was a declared devotee of the car and repeatedly praised motor vehicles in his writings and projects. For him, the car was the genuine “transport machine”, one that, with its rapidity would need a separate layer from pedestrians, a new layer that would drastically affect urban planning and would reshape the cities to come. It was a single object that embodied power, speed, transportation, and functionality; for Le Corbusier, a technological symbol. 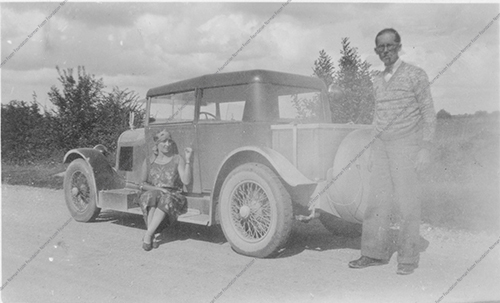 During the 1920s, automotive technology was progressing at a frenetic rate, bringing with it a new dimension of the perception of time and distance. With an urge to include these conditions Le Corbusier designed urbanistic utopias, megalopolis where the automobile represented a symbol of modernity and progress and was the clear focus of these new cities. Lately and following his passion for automobiles, in 1936 together with his cousin and business manager, Pierre Jeanneret, designed a car. It was the result of a competition sponsored by France’s Société des Ingénieurs de l’Automobile (SIA) that sought to create an inexpensive simple car for the people. It was meant to be a minimum vehicle with maximum functionality, therefore it was named Voiture Minimum. It was 370cm long and 185cm in width and height and it could comfortably accommodate 3 people in the front and an extra seat, that could be transformed into a camp bed, on the back. Even if it was never built, it did serve as an inspiration for later vehicles.